Editor's note: The team lost to South Korea in the title game Sunday 8-4 in exciting fashion. For details click here. 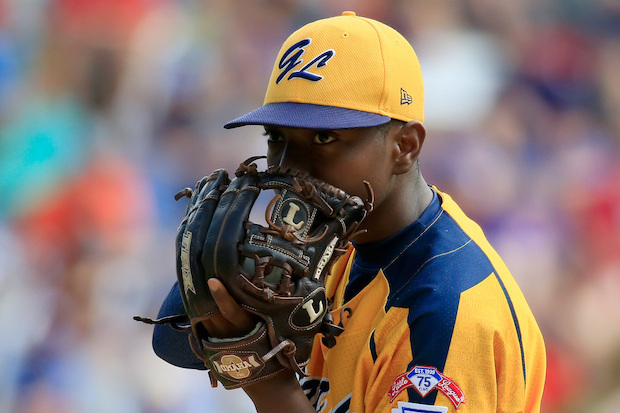 CHICAGO — Jackie Robinson West has won the Little League World Series United States title! The Morgan Park-based squad will play for the LLWS world championship against Seoul, South Korea, on Sunday after beating Las Vegas 7-5 Saturday in an Instant Classic rematch of the Far South Side club's only loss throughout postseason competition. "Now we're representing the United States, and we're going to try and do that well," JRW coach Darold Butler told DNAinfo Chicago early Sunday morning. "The support is great from everywhere. We appreciate the support. We appreciate that we could touch this many people and get fans to hop on the bandwagon. We've got a big wagon, so everyone can jump on." Sunday's world title tilt is 2 p.m. on ABC at historic Lamade Stadium in Williamsport, Pa. It's the second time a Chicago team has reached Little League's ultimate game. In 1967, North Roseland lost to West Tokyo in the world final. Butler said he was up into 2 a.m. Sunday morning watching tape of South Korea. He said the team from the Far East has "great" pitching, but that shouldn't be a surprise at this point in the tournament. "They've got arms," Butler said. "We're facing great pitching, but we've been facing good pitching this whole tournament." Butler said he has four pitchers — Brandon Green, Trey Hondras, Ed Howard and Pierce Jones — available for Sunday's game, and Green is the probable starter. Saturday's win gained JRW revenge on Las Vegas, which clobbered Chicago's youngsters 13-2 in four innings on Aug. 17. But, as JRW coach Butler correctly predicted on Friday, the result would be much different the second time around. Members of the Great Lakes Team from Chicago, Illinois celebrate following their 7-5 win over the West Team from Las Vegas, Nevada during the United States Championship game of the Little League World Series at Lamade Stadium on August 23, 2014 in South Williamsport, Pennsylvania. "As crazy as it sounds, I think they were at a disadvantage," Butler said Sunday. "We lost at the right time. We lost when it wasn't on the line. It woke us up. It gave us a chance to get in the groove. They ran into a hot ballclub. It was a way to build our character, our self confidence." In the teams' last meeting, Las Vegas scored four runs before JRW recorded an out. Saturday's game started in somewhat similar fashion as Drew Laspaluto smashed a three-run, two-out double that sailed over the head of DJ Butler in the first off starting pitcher Joshua Houston. But JRW came right back with a two-run homer from Hondras in the bottom of the inning off Brennan Holligan, a 6-foot-2 righty who shut down Chicago in their first game. Marquis Jackson then singled, advanced two bases on a wild pitch and tied the game on an RBI single from Darion Radcliff. In the second, Hondras drove in pinch runner Jaheim Benton with a two-out single to left for a 4-3 JRW lead. No teams scored until the top of the fifth, when Brad Stone hit a two-run homer to right as Las Vegas grabbed a 5-4 advantage. In the bottom of the frame, Holligan walked two JRW batters and had to leave the mound due to exceeding the 85-pitch count. He was relieved by Austin Kryszczuk, who gave up a game-tying base hit to Houston that scored Jackson. With runners at first and third and one out, Zach Hare relieved Kryszczuk, and Green gave JRW a 6-5 lead on a fielder's choice grounder to third that scored Benton. JRW tacked on another run on an error from the second baseman. Howard closed the game on the mound with a 1-6-3 double play. 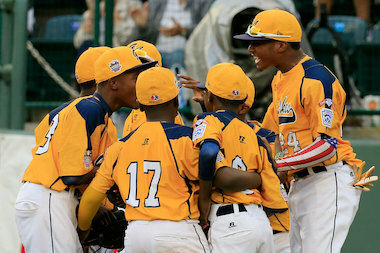 "Today the Jackie Robinson West All Stars have made history as only the third team ever from Illinois to reach the championship game of the Little League World Series and the City of Chicago could not be prouder of them," Mayor Rahm Emanuel said in a statement after the win. "Their positive attitude and success on the field has rallied people from every neighborhood to support these kids and they continue to demonstrate why they are the pride of Chicago. What a comeback. What a win!" Earlier Saturday, South Korea beat Tokyo, Japan 12-3. South Korea is looking for its third world title after claiming back-to-back crowns in 1984 and 1985. Head to the Kroc Center, 1250 W. 119th, for another Jackie Robinson West watch party at 2 p.m. Sunday. The mayor's office also said Saturday night there will be a watch party at State Street in front of the Chicago Theater (between Randolph and Lake Street). State Street will be closed between Lake Street and Randolph Street beginning at 12:30 pm. The street will remain closed until a short time after the game is over.